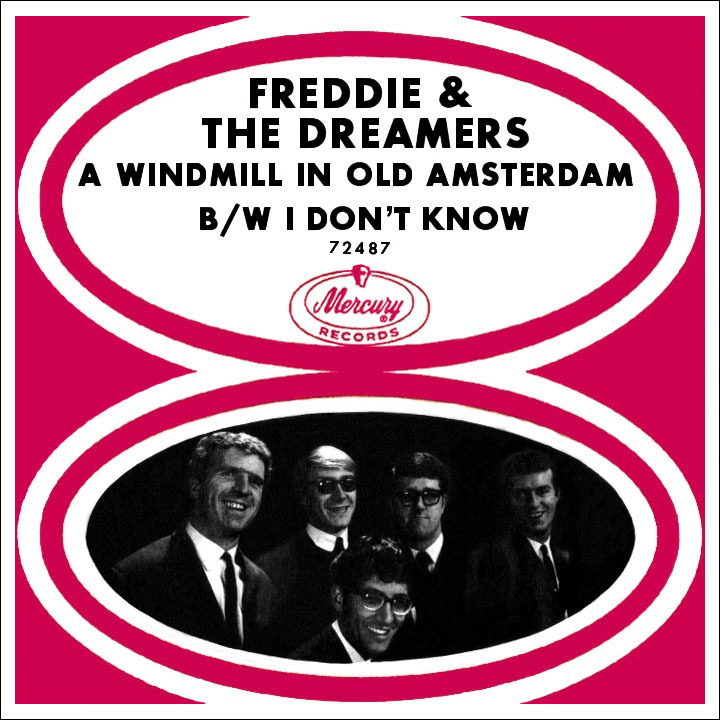 At some point Freddie and the Dreamers may have figured they'd be left behind, which would have made them one of, if not the, most popular mid-'60s U.K. acts to miss out on the charge across the Atlantic Ocean led by The Beatles. As it turned out, they joined the British Invasion nearly two years after Freddie's band had broken through at home, and the delay came with a bonus: "I'm Telling You Now," their biggest hit though not quite a chart-topper, enjoyed that extra "oomph" and made it to number one in the States. For Freddie Garrity it was a longer journey than most; he was 28 when that peak moment came, though publicists and the press depicted him as several years younger. Garrity grew up in Crumpsall, Manchester, about 50 miles inland from the port town of Liverpool, the future hub where music history would be made. In his late teens he was busy learning certain aspects of the construction trade, but in 1956, when he was 20, he shifted his focus to music, entered a singing contest (performing Al Jolson's "April Showers") and took first place. The skiffle craze had caught on and, giving nary a thought to anything sports-related, he started a band called The Red Sox with members playing banjo, tea-chest bass and the all-important washboard. He began developing the habit of jumping around onstage and laughing hysterically, a performance style that got a little crazier with time. Taking any sort of day job in order to free up his nights (selling brushes, shoes and suits and working as a milkman), the Red Sox made the rounds for a few years before breaking up, after which Freddie joined another area band, The John Norman Four (led by two blokes named John and Norman, of course). Skiffle was becoming passé by 1960 when he joined guitarist Roy Crewdson in The Kingfishers. Before long they were doing rock numbers with Freddie singing lead, Pete Birrell doing backing vocals and bass, Derek Quinn on lead guitar and Bernie Dwyer on the drumkit. Johnny Burnette's "Dreamin'" was big at the time and "dreamers" had a good ring to it; the lead singer's name was tacked onto the front and that was that. In early 1963, after spending a couple of years playing various nightclubs and parties, the timing seemed right right for a record deal; John Barry (who'd had many hit records and composed music scores for motion pictures, most recently the inaugural James Bond feature Dr. No) showed interest and had them record James Ray's one-and-a-half-year-old U.S. hit "If You Gotta Make a Fool of Somebody." 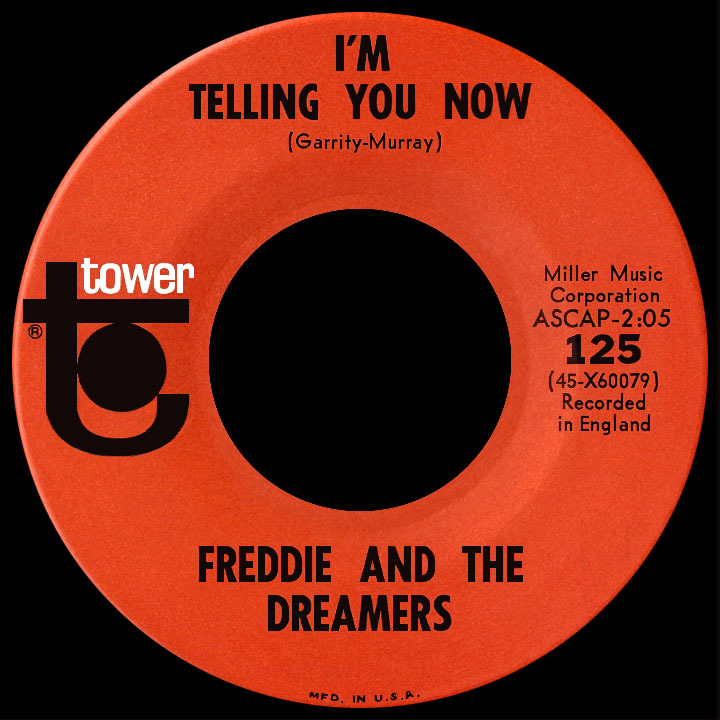 It got them a deal with EMI's Columbia label and in June '63 Freddie and the Dreamers were sitting at number three behind milestone hits by Gerry and the Pacemakers ("I Like It") and the Beatles ("From Me to You"). "I'm Tellin' You Now," a contagiously simple love song, was written by Freddie with Mitch Murray (who'd penned the first two Gerry and the Pacemakers hits); at the end of August it eclipsed the debut single but had to settle for a number two peak behind "Bad to Me" by Billy J. Kramer and the Dakotas. In the U.S., Capitol Records (an affiliate of EMI since the mid-'50s) had dibs on the Beatles but little interest (giving the Vee-Jay and Swan labels a chance with them); the label likewise passed on Freddie's James Ray cover, but felt "I'm Tellin'" had potential and released it 12 weeks before finally deciding to get behind the Beatles' fifth U.K. single. Back in the U.K., Murray's "You Were Made For Me," with a sound similar to its predecessor, spent four weeks at number three in December (unable to dislodge two Fab Four smashes, "She Loves You" and "I Want to Hold Your Hand," meaning all the singles that prevented the first three Dreamers discs from hitting the top came from acts managed by Brian Epstein). This was also released in the U.S. by Capitol; both Freddie records flopped as had the smaller-label Beatles releases, but with their ode to holding hands, the Beatles' time had come at last...in a nuclear-blast-fashion no one could have predicted...which was hardly any consolation (not yet, anyway) to Freddie Garrity. Capitol lost interest in Freddie and his Dreamers after these failures and Mercury Records picked up the licensing on them. The group's exaggerated moves (goofy dancing, jumping, kicking their legs from side to side) made them favorites on the telly and at live shows. The hits continued in the U.K., though sales never again reached the levels of the initial three. They made their first appearance in a movie, What a Crazy World, that starred hitmaking singers Joe Brown, Susan Maughan and Marty Wilde. 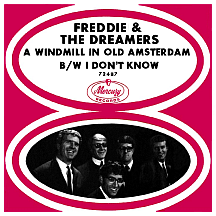 Freddie and the Dreamers sang and danced their way through three oddball selections: a "twist" variation on "Camptown Races," a folkish "Sally Ann" that doesn't resemble any of the various traditional songs of that title, and a remake of The Royal Teens' 1958 hit "Short Shorts." The crazy stage antics had evolved to a point where the band was doing lengthy comedy bits between songs...and auditoriums kept filling up. "Over You," composed by newcomer Alan Jones and Dreamers guitarist Derek Quinn, and Paul Anka's 1957 also-ran "I Love You Baby" were top 20 hits in the first half of '64. Freddie and the Dreamers participated in the Big Beat '64 concert at Wembley Stadium on April 26, 1964 alongside with a who's-who of the year's top British bands (capped by headliners the Beatles) deemed the best in a poll conducted by the trade mag New Musical Express (it was the 12th year NME had published the list and flaunted its influence with a party and/or concert featuring the poll-toppers). "Short Shorts" was one of three songs the band offered up while Freddie cut loose with his maniacal laugh a little more than usual; the concert was aired on Britain's ABC Television. They were seen next doing "You Were Made For Me" in the film Just for You, released to theaters in the U.K. in June 1964. Just three months later the quintet showed up in another movie, Every Day's a Holiday; set at a seaside resort, with chart-topping singers John Leyton ("Johnny Remember Me" in '61) and Mike Sarne ("Come Outside" in '62) competing for the same girl (Murray's wife Grazina Frame, a singer who'd also been in What a Crazy World and worked steadily as an actress for the next three decades). The band played chefs; Freddie claimed to be "The King of Cheese Souffle." Meanwhile in the real world, Murray's "Just For You" became their first single to miss the top 40 - still better than a blanket stateside no-show. 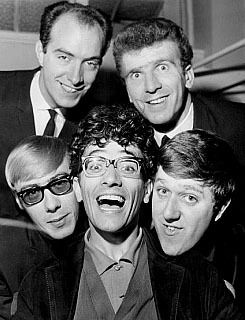 The fun-loving guys reappeared in the U.K. top ten with a very serious song, "I Understand (Just How You Feel)" (penned by Pat Best of The Four Tunes, the group that originated it in 1953). They'd been doing the song since The G-Clefs' version had been a hit in '61 and performed it nightly during Another Beatles Christmas Show, a series of concerts at London's Hammersmith Odeon (Freddie opened the show swinging on a rope and wearing a tutu! ); this lunacy went on display twice most nights over more than three weeks in December '64 and January '65. Epstein must have taken note of their lack of success in America and, as the host of a British segment of NBC-TV's new Hullabaloo series that debuted on January 12, 1965, he arranged for them to travel to New York for a guest spot. 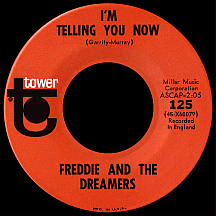 Capitol reissued "I'm Telling You Now" on its subsidiary Tower label (a less informal "g" had been added to the first word of the title, even on the earlier Capitol 45). Garrity and the guys went through the experience of breaking through as a brand new act a second time, two years removed...and got a thrill they hadn't known back home: in April, the single hit number one. The height of their fame in America came on the anniversary of the previous NME event...and once again they participated in a supershow aired on British TV, serving up "Little Bitty Pretty One" and latest hit "A Little You" (penned by Gordon Mills, who was having luck at that time writing for Tom Jones) for the New Musical Express Poll Winners' Concert April 11, 1965. The show had a pretty fair lineup of artists who had, or were about to, enjoy huge U.S. success: The Moody Blues, Georgie Fame, Herman's Hermits, Wayne Fontana and the Mindbenders, The Rolling Stones, Cilla Black, Donovan, Them, The Seekers, Searchers, Animals, Beatles and final performers The Kinks! "I Understand (Just How You Feel)," released on Mercury, debuted on the charts the same week as "I'm Telling You Now" and reached the top 40 just as the bigger song was coming off number one. "Do the Freddie" (hawking the dance based on Garrity's nimble-limbed stage moves) and "You Were Made For Me" also began climbing the Billboard Hot 100, giving them four simultaneous entries on the national survey the first two weeks in May, all of which peaked in the top 40. At about that time, on the group's third Hullabaloo appearance, they demonstrated the dance and were joined onstage by host Trini Lopez and guests Chuck Berry, Vikki Carr, Martha and the Vandellas and fellow Mancunians Herman's Hermits...all onstage together doing the "Freddie"...the nation's hottest dance, perhaps only for that moment! It was a scene witnessed in America only; as much as the British loved novelties, "Do the Freddie" wasn't issued as a single there. In America, though, Chubby Checker somehow got a different song about the dance, "Let's Do the Freddie," onto the charts before the Dreamers disc and both records were in the top 40 at the same time. The band's impact in the U.S. was fleeting, but hadn't quite ended by the time their four near-simultaneous hits fell off the charts in June. Every Day's a Holiday was rereleased in the States as Seaside Swingers. "A Little You" reached the top 50 in August (unlike the other hits it was recorded with a full orchestra, and that floated Freddie's boat). Capitol only had the rights to four songs (the A and B sides of their second and third U.K. singles) and they managed to stretch these to three 45 releases by putting songs by other Brit bands, The Beat Merchants (a bluesy rock remake of The Fiestas' '59 hit "So Fine") and Just Four Men ("There's Not One Thing," a midtempo, guitar-based love song a bit ahead of its time), on the flip sides. But for Garrity composition "Send a Letter to Me," originally a B side in England (and on the backside of some U.S. copies of "You Were Made For Me"), time had run out. A few more singles came and went in the U.S. while "Thou Shalt Not Steal" (a country-tinged ballad) became the band's final U.K. charter. The quintet's crazy antics transferred well to film (but did all the tomfoolery overshadow the music? ); they did two songs in Universal's 1966 spy farce Out of Sight and three, including the title theme, in the 1967 scout troop comedy The Cuckoo Patrol. The original group split up in 1968, though Freddie continued making records with various supporting musicians credited under The Dreamers' name. He toured with similar backing bands for many years, mostly in the U.K., while doing occasional television work. Freddie Garrity relished his role as the British Invasion's designated jester and kept joking, cackling and leaping high in the air during and between songs until shortly before his death in 2006.